A group of Methodist College nursing students recently went into the community to help a local non-profit through a time of transition. 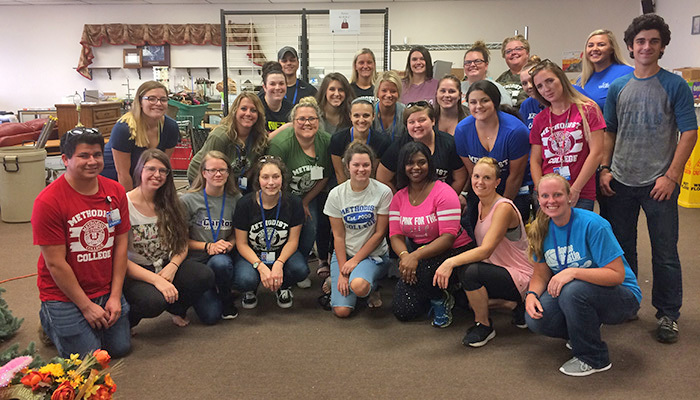 The students in the N120 Concepts of Health and Healthcare course taught by nursing instructor Gwen Huls, spent time at the South Side Mission Thrift Store on Pioneer Parkway in Peoria. South Side Mission operates three thrift stores in Central Illinois, and the Pioneer Parkway location closed on August 31 and is moving to the former Aldi store on War Memorial Drive. "The students made a human conveyor belt to empty the upstairs storage area of holiday decorations," said Huls. "It was a dusty, dirty, and sweaty job, and the thrift store staff were very grateful for our students' help." In the N120 course, students learn about Maslow's Hierarchy of Needs, which states that physiological and safety needs must be met before people can achieve higher levels of wellness. Huls stated that the thrift stores raise more than $1 million dollars per year to support the work of the South Side Mission. The mission provides food, shelter, training, and ministry to residents in some of the most economically disadvantaged areas of Peoria. Learn more about the Nursing program at Methodist College.